Despite calls for more measures to get cars off of Market Street, and the benefits brought by the forced turns already put in place, the SFMTA still has yet to propose any new restrictions on private autos. The agency does, however, plan to make some paint upgrades to help keep Muni moving this spring or summer. 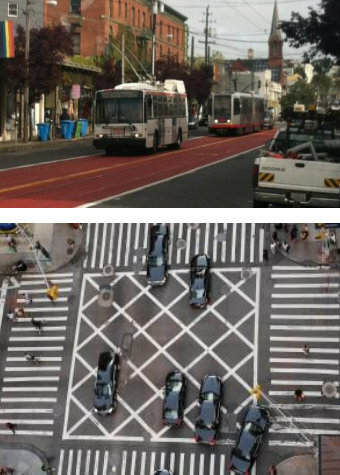 Existing transit-only lanes will be painted red, and a cross-hatched paint striping telling drivers not to “block the box” will be added at intersections where cars chronically back up and block cross traffic. SFMTA staff told its Board of Directors this week that the agency and the SFPD would also develop a plan to step up nearly non-existent enforcement of transit lanes and box-blocking on Market. Yet the agency has repeatedly delayed its promises to put forward proposals for new forced turns or potential bans for private autos on Market, to the frustration of car-free Market champions like Malcolm Heinicke, an SFMTA Board member, and Supervisor David Chiu, who introduced his second resolution urging the SFMTA to move the efforts along. The resolution was approved unanimously by the Board of Supervisors this week. Heinicke had requested that SFMTA staff present a proposal for car restrictions at the previous planning meeting one year ago, and Reiskin said it would come by this winter, but then postponed it to Tuesday’s meeting. Now, Reiskin says the proposals will be ready to be considered as part of the SFMTA’s two-year budget, which is scheduled to be finalized by March. “I share the frustration, and take responsibility for the fact, that we don’t have something by now,” he said. Heinicke has suggested that the complications of traffic diversions could be avoided by instituting a sweeping ban on private cars along lower Market. Long-term plans for car-free stretches, ranging as far as the Embarcadero to Van Ness Avenue, are proposed as part of the Better Market Street project, but that wouldn’t be completed until 2019. That project has also been repeatedly delayed from its original 2015 schedule. In the meantime, the SFMTA and DPW have repaved much of lower Market and added more green-backed sharrows, making the city’s busiest bicycling street a little less perilous. The coming red-painted transit lanes, like the ones on Church Street, and the “don’t block the box” markings are the latest low-hanging fruit, but the SFMTA and Mayor Ed Lee continue to skirt the issue of car bans, despite the increased transit speeds, bicycle ridership, and safer streets for pedestrians that have resulted from traffic diversions at 10th and Sixth Streets. 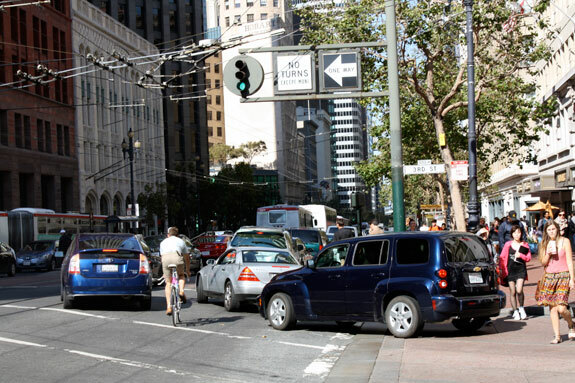 Supervisor Chiu introduced a resolution in 2011 urging the SFMTA to move ahead with car restrictions ahead of Better Market Street, and it seems unlikely that his second one, passed on Tuesday, will carry any more sway. While Mayor Lee may have the power to move things along, he has not shown support for getting cars off Market. “Don’t Block the Box”: SF catching up to where NYC was in 1984 minus the $200 fine and points on the license. Can’t we do more? SF doesn’t want private autos on Market but we’ll slow the 30/45/8x by putting in a right turn pocket off of 3rd onto Market and moving the stop back 500′. They need to get the officers out of their carts and directing traffic downtown (and handing out tickets). In London (and I imagine other cities) there are sensors underneath the cross-hatching. If your car is stationery over the cross-hatching for longer than 3 sec, you’re mailed a £130 ticket. Really? Do you have a source? I couldn’t find anything online about that. Sure. I know about the sensor/camera enforcement anecdotally (used to live in London). Not all “yellow box junctions” have the sensors/cameras, relying on police enforcement. Anybody in any way associated with the Third/Market transit disaster (pictured!) needs to be crucified. No question. It is that unambiguously bad an indictment the World Class City and it’s World Class Transportation Planning Professionals. A right hand turn prohibition at this intersection — a matter of a day’s work — would, unquestionably, return more travel time savings and fleet efficiency than any of the infinitely-studied never-implemented TEP Crap, let alone anything in SFMTA or SFCTA’s insane pork barrel capital plans. SFMTA is unambiguously a pure money laundering operation for the Central Subway and similar negative return corporate/agency welfare. There is no evidence that anybody with any policy-setting power in the organization is anything but the most craven Willie Brown sock puppet. Just stop funding it altogether; things can’t get any worse. Geary bus lane repainting by 2019! Maybe! Need moar studies and moar monee! Market Street something by we’ll get back to you on that! Late to the party, but DPT tried Don’t Block the Box in the late ’80s around Second St and Moscone. Dunno if it was ever enforced, but that’s another discussion.